In the magnificent atmosphere of the ancient historic city of Lübeck takes place an exciting advent, with numerous Christmas markets, shows, songs and other Christmas events. 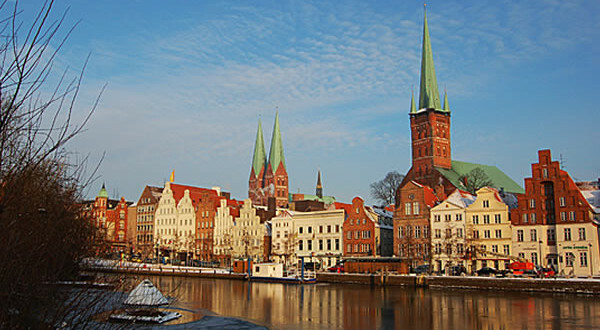 Lübeck was an important city of the famous Hanseatic League and today retains evidence of its glorious past which have earned it a place among the world heritage sites of UNESCO. 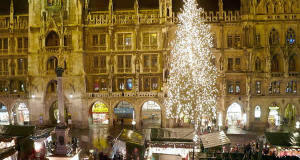 The first Christmas market, of which we have testimony in Luebeck, dates back to the mid-seventeenth century. 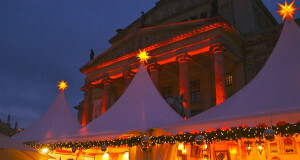 1) Christmas market in the Markt and Town Hall (Weihnachtsmärkte auf dem Markt – Lübecker Weihnachtsmarkt am Rathaus). 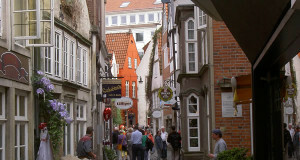 Historic market that takes place in the historic center of Lübeck and dating back to the seventeenth century. 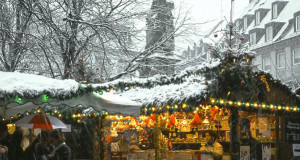 This market that takes place in the main square of the city – the Markt – and nearby streets, is the main Christmas market in the city with numerous wooden chalets and many Christmas items and German gourmet products. Opening: 26 November – 24 December 2018; 26 December – 30 December 2018. Opening Hours: Monday to Friday from 11.00 to 21.00; Saturdays and Sundays from 11.00 to 22.00. On December 24 from 11:00 to 14:00. Closed on December 25. 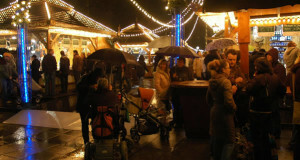 2) Koberg Maritime Christmas Market (Maritimer Weihnachtsmarkt). This market that takes place in Koberg square and nearby streets recalls the maritime past of this district of the city of Lubeck. The Koberg is located in the district of St. James (Jakobi) and is a picturesque place in the north of the old town of Luebeck. Opening: 26 November – 24 December 2018; 26 December – 30 December 2018. 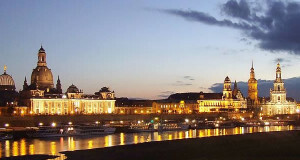 Opening Hours: Monday to Sunday from 11:00 to 21:00 (on Fridays and Saturdays until 22.00). On December 24 from 11:00 to 14:00. Closed on December 25. 3) Medieval Christmas Market (Mittelalterlicher Weihnachtsmarkt Marienkirchhof Lübeck). 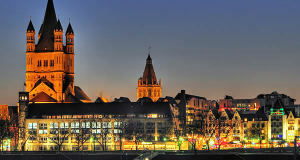 Dedicated to the ancient crafts, it is held in the atmosphere of the churchyard of St. Mary (Marienkirche). Opening: 26 novembre – 23 December 2018. Opening Hours: Monday to Sunday from 11:00 to 21:00 (on Fridays and Saturdays until 22.00). 4) Fairytale Forest (Märchenwald an der Marienkirche). This enchanted forest is located next to the church of St. Mary (St. Marien), here are revived the fairy tales of Snow White and the Seven Dwarfs, The Sleeping Beauty and Other Fairy Tales of the Brothers Grimm. Opening: 26 November – 23 December 2018; 26 December – 30 December 2018. Opening Hours: Monday to Saturday from 10.00 to 19.00. Sundays from 11.00 to 19.00. Closed on December 24 and December 25. On 26 December open from 14.00 to 18.00. 5) Market of the old hospital of the Holy Spirit in Koberg (Kunsthandwerkermarkt Heiligen-Geist-Hospital am Koberg). Arts and crafts market whose profits go to charities works, the market is located in a beautiful medieval building with frescoes, there are stalls selling handicrafts ceramics, wood, glass, wool, silk and leather, dolls and puppets. Opening: 30 November – 10 December 2018. Opening Hours: Monday to Sunday from 10.00 to 19.00. 6) Market of handmade items of Northern Europe (Kunsthandwerkermarkt in St. Petri). 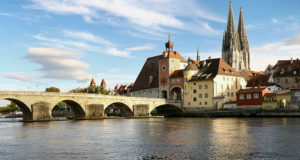 This market takes place in the church of St. Petri in Schmiedestraße and offers crafts of the countries of Scandinavia and northern Germany, such as ceramics, carved wood, textile art, jewelry, glass, amber, textiles and other wool works. Opening: 29 November – 20 December 2018. Opening Hours: Monday to Sunday from 10.00 to 19.00. 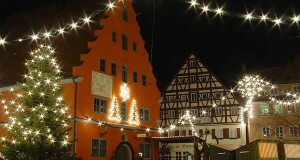 7) Wonders of Christmas on Obertrave (Weihnachtswunderland an der Obertrave). This small Christmas village – located on Obertrave against the backdrop of the picturesque old town of Lübeck – is dedicated to children, here is a beautiful playground with many attractions: the forest of Christmas (Wichtelwald), the Christmas bakery (Weihnachtsbäckerei) and an ice rink for children. Opening: 26 November – 23 December 2018; 26 December 2018 – 1st January 2019. Opening Hours: Monday to Sunday from 11.00 to 19.00. Closed on December 24 and December 25. 8) Niederegger Christmas Market (Niederegger Weihnachtsbasar: Marzipan aus Liebe). This market set up in the Niederegger Café of Lübeck and is dedicated to marzipan, there are all varieties and forms of marzipan and many other sweets of Lübeck. Opening Hours: Monday to Saturday from 9.00 to 20.00. Sunday from 10.00 to 18.00.